The high-tech suit “Armaxion” brings together all the characteristics of high quality textile motorcycle apparel that is ahead of its time. The Armaxion suit is made of abrasion and tear resistant Gore-Tex three-layer laminate with an upper layer of 500D Cordura fabric and a durably waterproof, extremely breathable Gore-Tex Pro membrane. In some zones, highly comfortable elastic Cordura ensures even better fit, while Armacor is used to reinforce the upper layer in exposed areas. 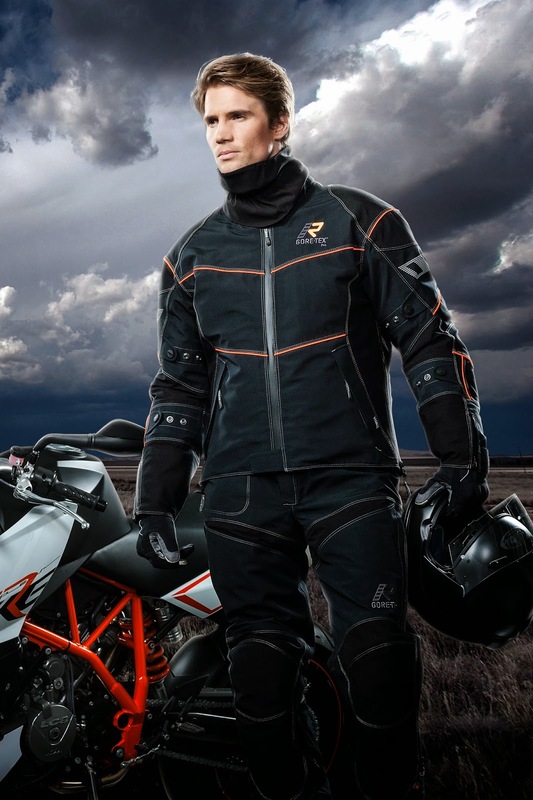 The jacket and the trousers have removable thermal linings for warmth on cooler days, while in hot weather, two-way ventilation zippers at the sides, on the back, and on the thighs can be opened to guide the air stream into the suit if desired. Annoying slippage on the seat is prevented by a non-slip Keprotec-Antiglide panel on the trousers’ seat area, while the AirCushion system on the inside acts as a climate buffer against the motorcycle’s seat, dissipating condensation. The soft neoprene collar, the detachable neck warmer made from elastic three-layer laminate, as well as the water- and windproof cuffs make for optimum comfort of the jacket. Sleeve and waist adjusters ensure a perfect fit of the suit. Several waterproof pockets offer space for the wallet, mobile phone and other necessities. The highly comfortable Rukka D3O Air protectors on the joints and in the back ensure high levels of safety by multiplying their protection in the very moment an impact occurs. The Armaxion jacket is available in the colour combinations Black/Red, Black/HiVis Yellow, and Black with orange pipings in sizes 46 through 62 as well as in Black with silver pipings in sizes 46 through 66. The Armaxion trousers come in Black with regular leg length in sizes 46 through 62, with shorter legs in sizes 48 through 66, and with longer legs in sizes 48 through 58. The prize would be from € 899,- (jacket) and € 599,- (trousers) including VAT.